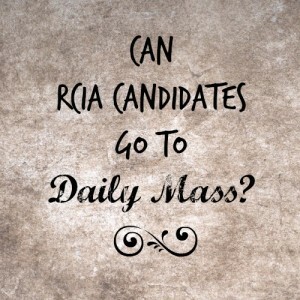 Can RCIA Candidates go to Daily Mass? In reviewing my website analytics, I discovered that someone came across my blog after typing this question into Google. I just wanted to provide a big old YES! 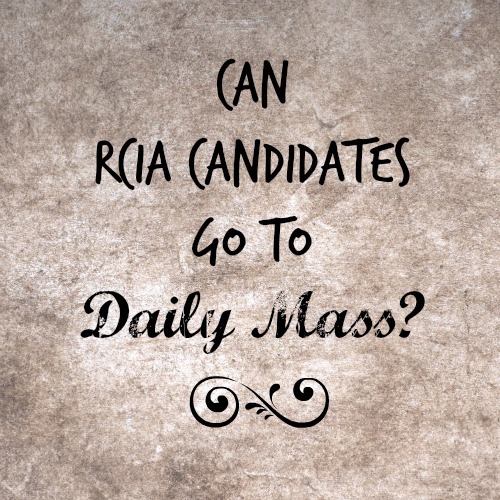 You can most definitely attend any type of mass as an RCIA candidate or even as a non-Catholic. The only thing you cannot participate in is receiving the Eucharist. While I was in RCIA, I attended daily mass quite often. I learned SO much from the homilies and was inspired to learn more on a variety of different topics. I always chose to go up and receive a blessing from the priest during mass, though if you are uncomfortable, you don’t need to do that. I always looked at it as I’ll take any and all blessings I can get :). If you choose to go up, just cross your arms over your chest and the priest will know you would like to receive a blessing instead of communion. Or alternately, you can just stand in the pew and wave others past you. Catholics do not receive communion if they feel they have committed a mortal sin, as we must be in a worthy state to receive, so you likely will not be alone in not receiving the Eucharist. One other note, I felt daily mass was confusing at first, as it seemed different to me than Sunday mass. It is a shortened form and sometimes they choose alternate versions of some of the things we speak aloud. Find a guide to the mass and bring it along. You may also want to pick up guidebook outside the chapel or church or get yourself a missal, which has the daily readings, as well as the Entrance Antiphon, which we say at the beginning of mass, and the Communion Antiphon, which we say at the end of mass. Just follow along with everyone else and after a few weeks, you’ll have it down pat. Got other questions about RCIA? Shout! I would love to help. Welcome to the Catholic Newbie Blog! Welcome to my Catholic Newbie blog, a place for all those considering Catholicism or apprehensive about Catholicism to de-mystify this life-changing religion. I started out as a non-believer – for 30 some years! – and came around early this year. 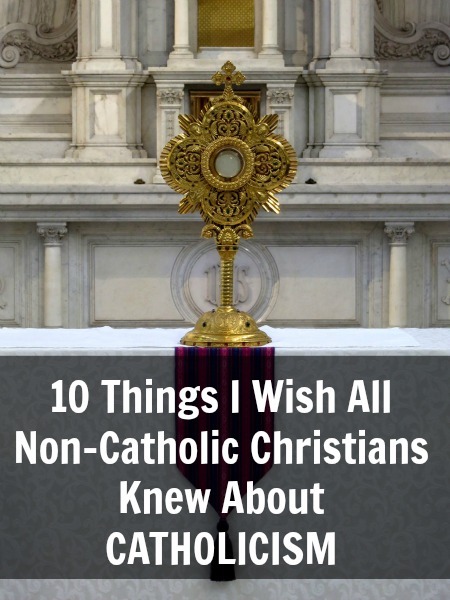 I’d like to share my story with you in the hopes that you won’t write off Catholicism without taking the time to learn more about it from someone who can give it to you straight and who’s been right where you are. I plan to blog about my journey to become Catholic — Easter 2013 — and I hope you will join me!